Brick models are graphs consisting of nodes and directed edges. These graphs are usually represented using the RDF data model, which represents a directed, labeled graph as a set of triples. A triple consists of a subject (node), a predicate (directed edge) and an object (node). Each triple represents 2 nodes (the subject and object) connected with a directed edge (the predicate). We will interact with the graph by way of these triples. Triples are usually stored in a self-contained text file in the Turtle format (file ending .ttl). Identifying flows: bf:feeds/bf:isFedBy. Used for flows of water, electricity, air, etc. Recall that in the RDF data model, all nodes are either Literals (strings) or URIs. All URIs have a namespace: for example in the URI https://brickschema.org/schema/1.0.1/Brick#VAV, the namespace is https://brickschema.org/schema/1.0.1/Brick# and the “node” is VAV. For convenience, we will abbreviate the URI so we can write brick:VAV instead of https://brickschema.org/schema/1.0.1/Brick#VAV. There’s a lot in those namespaces, but don’t worry! It will feel managable soon enough, and HodDB includes tools to make it easier to find the URIs you need. Note that we are using a new namespace to “store” the names of the entities that are actually in our building. SPARQL is a query language for RDF, but common Brick usage only uses a subset of its features. One way of thinking about SPARQL is treating a query like pattern matching over the graph (i.e. finding graph isomorphisms). A SPARQL query consists of a WHERE clause containing the patterns of triples we want to match, and a SELECT clause identifying which parts of those triples we want to return. SPARQL variables are indicated by a ? prefix (e.g. ?vav). Variables take the place of subjects, predicates and objects in the terms of our query. And the returned results would be mybuilding:vav_1, mybuilding:vav_2, etc. Variables can be used more than once in a query, and a term can contain more than one variable. Variables in the SELECT clause determine the “rows” that get returned as the result of a query. A natural question when interacting with a new Brick model is what kind of information is associated with a particular VAV. We can express this as a SPARQL query by seeing which triples exist that have a VAV as the subject. The above queries work well if we know the exact classes instantiated in our Brick model. If we don’t have this information and want to discover it, we can leverage Brick’s class hierarchy. 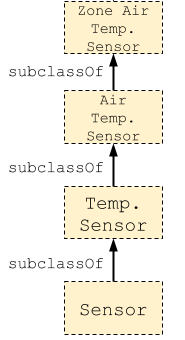 A common use case is finding which kinds of temperature sensors exist in the Brick model. The basic form of this uses both the rdf:type relationship (instantiation) and the rdfs:subClassOf relationship. By default, mentioning a predicate only traverses a single edge in the graph. We use SPARQL’s * operator to match “0 or more” instances of an edge to transparently query more than one level of the hierarchy. SPARQL also provides a + operator to match “1 or more” edges. The point of these explorations is not to implement cutting-edge fault detection/diagnosis algorithms, but rather to illustrate how Brick can make it easier to find the relevant data streams and make an implementation portable across buildings. One method of detecting stuck dampers is to look at the difference between the supply air flow sensor and setpoint for a VAV. 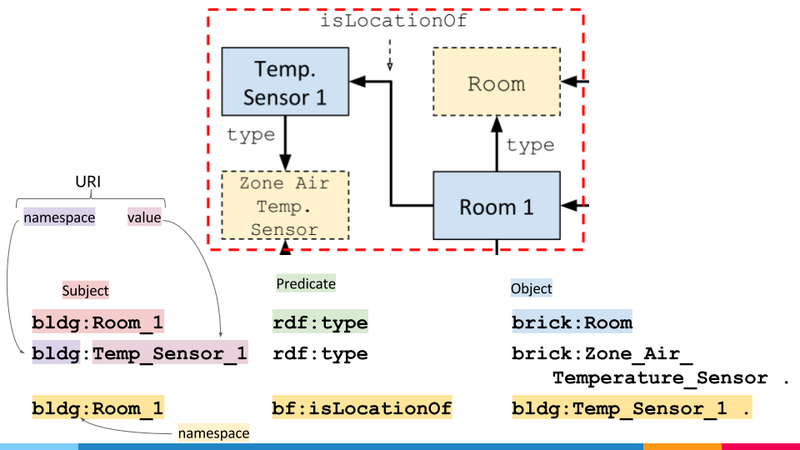 First, we write the Brick query(ies) to extract the relevant data streams: namely, the supply air flow sensor and supply air flow setpoint for each VAV in our building. In addition to the names of those points, we also extract from the Brick model some “timeseries identifier” that will point us to where we can obtain the actual data. Here, we use the brick:hasUuid relationship which points to an RDF literal corresponding to the name of a CSV data file. We will then identify the supply air flow setpoints and sensors using the rdf:type relationship, and because they measure an aspect of a VAV, we know they will be related to a VAV using the isPointOf relationship. Properly identifying simultaneous heating and cooling in a building involves traversing the HVAC and spatial hierarchies of the building. We must first find rooms that are contained within more than one HVAC zone and therefore are conditioned by more than one VAV. From this, we have a few possible avenues. First, we can compare the reheat coil percentages for the VAVs feeding a single zone. Additionally, we can look at the cooling coil percentage for the AHU upstream of each VAV combined with the supply air flow as further evidence. To begin, we need to find rooms that are in more than one HVAC zone. We follow the same procedure for building up the query: identify the instances of the relevant classes, and then filter these by the required relationships. <our room>  bf:isPartOf    ?zone . The last triple gets us the UUID for the timeseries data representing the actual reheat valve command values. As of version 0.5.1, Hod supports loading and querying multiple graphs in parallel. The most helpful use for this is loading multiple buildings into a single HodDB database and querying across them..
Load in buildings and name them using the Buildings key of the hodconfig.yaml file (documentation link). By default, all of the graphs in HodDB are queried. This can be changed (or made explicit) through the use of a FROM clause, which specifies the graphs to query by name in a space-delimited list. For example, consider a databse in which we’ve loaded 2 graphs: bldg123 and bldgABC. Brick models contain references to devices and other sources of data. There are two pieces of information typically associated with each data source: the UUID (timeseries identifier) and a URI (for BOSSWAVE publish/subscribe). UUIDs and URIs are stored as RDF Literals (strings) in the Brick graph, and are found using the https://brickschema.org/schema/1.0.1/BrickFrame#uuid/bf:uuid and https://brickschema.org/schema/1.0.1/BrickFrame#uri/bf:uri relationships.